Black Stars Workshop - November 30, 2014!!! "Save the date for our next workshop!" NOVEMBER 30TH at Joy of Dance Studio. "An experience of a kind!" We've had the opportunity to represent Black Stars at WE DAY Toronto...in front of 20,000 people and live on TV! What a feeling to see so many people inspired by our dance and our culture...an amazing blessing. Win Tickets to Canada vs Ghana soccer game!! Black Stars would like to thank their fans and supporters by giving away a pair of tickets to the upcoming FIFA U20 Women World Cup match, Canada VS Ghana!! How to win? You just need to like the Black Stars Facebook page. That gets you in the draw and the winner will be announced on Monday (August 4, 2014 at 9pm). The match will take place on Tuesday (August 5, 2014 at 8pm) in Toronto at National Soccer Stadium. Looking for more chances to win? You can get a second entry on twitter! Follow @blackstarsto on twitter and tweet or re-tweet using#blackstarscontest to win. See you online – and good luck with the contest! 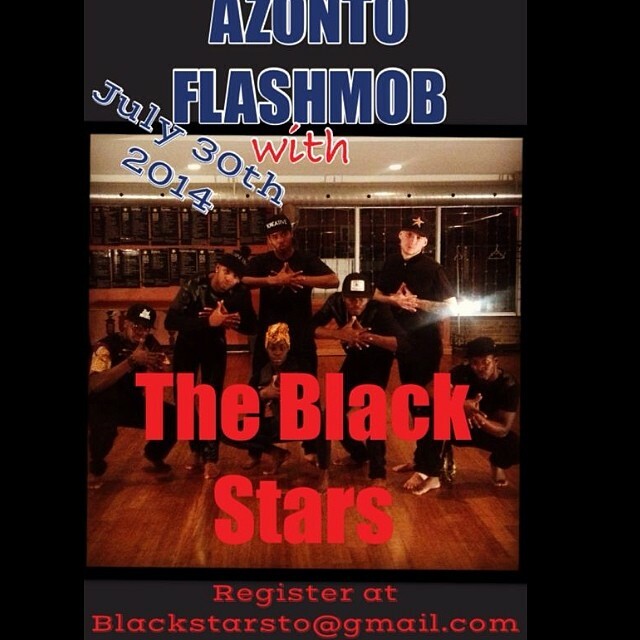 The FIRST EVER Azonto Flashmob happening July 30th with @blackstarsTO at Yonge and Dundas Square! Yup it's happening!!! Tell a friend and spread the word! Register today at blackstarsto@gmail.com.